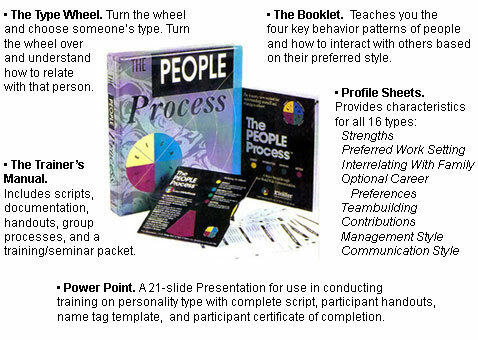 The PEOPLE Process®: personality type Wheel for understanding self and others. Based on Jungian type theory. The PEOPLE Process® is a tool to evaluate psychological personality types, based on the personality type theory of Carl Jung. Jungian type theory is useful in understanding yourself and others in your relationships, your workplace, family dynamics, etc. Personality type affects all relationships. Understanding your own four-letter type, and recognizing someone else's, offers you a powerful advantage in communicating with all types of people. bring out the best in each. Understand why people act the way they do. Use the best listening techniques to strengthen communication. Tune in to the needs and feelings of co-workers and achieve office harmony. People are different. We think, act, and process information differently from each other. We all know this, but why and how we're different is less obvious. This often results in peresonality clashes. Understanding how someone else's brain works differently from yours is beneficial to any kind of relationship—personal or professional, formal or casual. A quick and easy process for gaining insight into the personalities of others. If you’re presenting information to a potential customer, how do you determine what strategy is best? Should you joke around? Stick to the facts? Make small talk? Cut to the chase? The right approach can mean the difference between getting your ideas across and getting your signals crossed. Pam Hollister, co-developer of The PEOPLE Process®, has 35 years professional business experience with emphasis on entrepreneurship, marketing, and business communications. She has taught The PEOPLE Process at So. Nevada Community College, University of Nevada-Las Vegas, Fortune 500 companies, US Air Force, Department of Energy, and school districts throughout North America. Pam is a Certified Practitioner with The Law of Attraction Training Center and teaches teleclasses on personality type and the law of attraction. Myers-Briggs Type Indicator is a trademark or registered trademark of the Myers-Briggs Type Indicator Trust in the United States and other countries.